Slice enough strawberries to fit around the biskuit and for decoration. Puree the rest with the sugar and vanilla, set aside. Fit a ring around the biskuit, and lightly oil (to prevent sticking later). Place strawberry slices around the inside of the ring. Soak gelatine in about 1/8 cup of water, put on low heat until melted. Mix yogurt with the pureed strawberries, and mix 2 spoons full with the melted gelatine, then mix the gelatine mixture with the yogurt cream. Beat whipping cream until stiff (don't overbeat) and carefully combine with the yogurt-strawberry mixture. Slowly pour everything into the form on top of the biskuit and refrigerate at least 4 hours, or overnight. 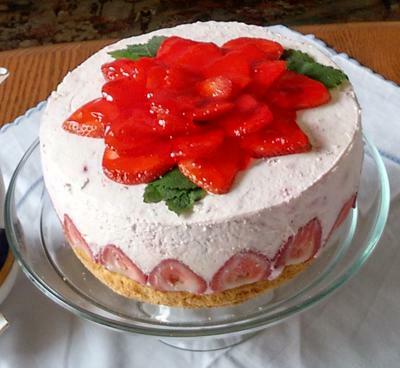 Decorate with either sliced or whole strawberries - mint leaves give it a nice green touch. Beat egg yolks with 2/3 of the sugar until foamy, add lemon rind. Beat egg whites with the rest of the sugar until stiff peaks form and pour over beaten egg yolks. Add the sieved flour and corn starch, and carefully lift and fold under until everything has been incorporated. Put batter into a greased 9-inch springform pan. "I'm using a 9" spring form. Especially for a 'high' Torte, also for my cheese cakes." Thanks for noticing this info was missing. I've edited the recipe to include it. what size german springform? I have German sizes.